Anyone who contributes – or in whose name is contributed – a gift of US $1,000 or more to the Annual Programs Fund of the Rotary Foundation may become a Paul Harris Fellow. 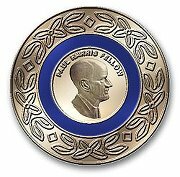 Each new Paul Harris Fellow receives a commemorative certificate, a Paul Harris Fellow pin and a medallion. The Rotary Foundation supports educational and humanitarian programs throughout the world.